Tata Harrier and Buzzard likely to get four-wheel-drive soon. Both could also get a sunroof of sorts to add to the luxury quotient. Tata Motors is working on sunroof solutions currently. Harrier rivals - the Jeep Compass and Mahindra XUV500 - offer 4x4 and sunroof. 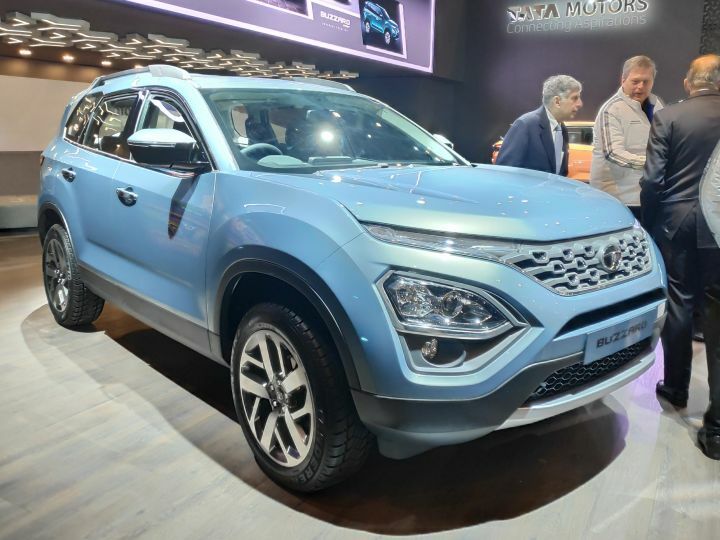 Tata Motors is reportedly working on equipping the Tata Harrier as well as the Tata Buzzard (likely to be renamed for India) that was unveiled at the 2019 Geneva Motor Show with proper off-road tech. The Harrier and the Buzzard are the homegrown car manufacturer’s flagship products. They will eventually replace the Safari Storme and the Hexa, both of which get four-wheel drive variants. So, it seems fit to equip the modern monocoque SUVs with all-wheel drive tech to take on their rivals, including the Jeep Compass and the Mahindra XUV500. Surprisingly, when Tata launched the Harrier, it had categorically mentioned that the SUV will not be offered with four-wheel drive as the demand for such vehicles was too little to justify the development costs. However, Tata Motors seems to have realised that although the demand may be small, there are quite a few out there who want to upgrade from their all-wheel-drive Safari or Hexa to the Harrier or the Buzzard. Tata Motors is known to build sturdy and reliable off-roaders. However, expect the carmaker to borrow Jaguar Land Rover’s know-how to make a truly world-class off-roader out of the Harrier and the Buzzard. We expect both cars to feature various terrain modes as well as other functions such as hill-hold and hill-descent control, and excellent water-wading capabilities. However, it remains to be seen if both cars will feature the Harrier’s current semi-independent twist blade with coil spring suspension setup or go for a fully independent system that could offer better wheel articulation. Also, expect the Harrier and Buzzard to get an uprated version of the Fiat-sourced 2.0-litre Kryotec diesel engine. Currently, it produces 140PS of power and 350Nm of torque in the Harrier. The upcoming Buzzard, on the other hand, gets a more powerful 170PS tune while producing the same amount of torque. The addition of 4x4 drivetrain will surely increase the cost of both SUVs. However, it will also help Tata Motors take on 4x4 variants of the Jeep Compass as well as the Mahindra XUV500. The biggest news from Tata’s stand at the Geneva Motor Show, however, has to be the admission that the Harrier and Buzzard will soon receive a sunroof. Well, kind of! Tata has reportedly been toying with the idea of a sunroof and is currently looking at sunroof solutions. However, the solution Tata is looking at is far from a conventional one. The issue with a sunroof is that it’s not a cut/paste job. Then there is the reduction in headroom and the safety concern especially due to its misuse in India. Keeping these factors in mind, Tata is likely to fit the Harrier and the Buzzard with a fixed glass roof instead of a sliding sunroof. It isn’t clear if the glass roof will be paired with the 4x4 variants or not, because if they are, the roof will need to be mighty strong to ensure occupants are safe incase the car tips over while navigating off-road. But Tata Motors seems more determined than ever to produce world-class cars at sensible prices and we expect it to do a stellar job with the 4x4 versions of the Harrier and the Buzzard paired with a glass roof or not. Stay tuned to ZigWheels for more updates.